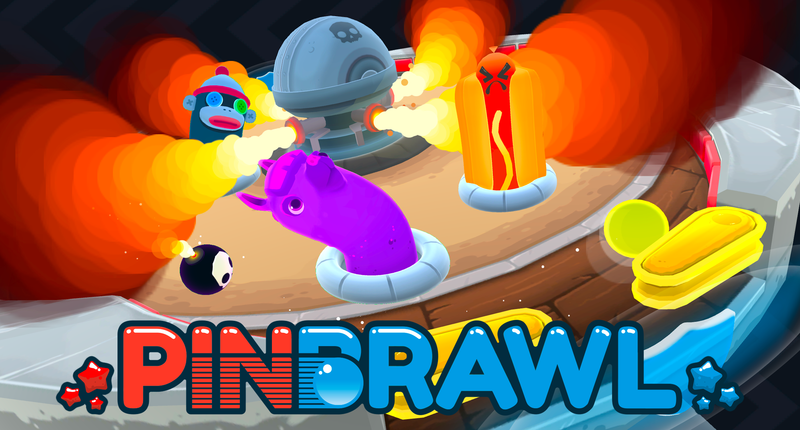 Pinbrawl will be making its grand debut at GDC 2018, where it will be exhibited and officially be announced for a console! We will be announcing which one on the 13th of March (although we are hoping to nail down all 3 before release). Shortly after, the game will be making its way to Steam Early Access, which is another exciting milestone! So, we did something pretty crazy. Tilt is gone, and so is burrowing. There were just too many things going on at once, and players often felt that they could only focus on a couple elements of the game at a time, usually leaving a core mechanic like tilting or brawler controls on the back-burner. We think, overall, the game is 10x more approachable now. You simply control flippers with the trigger buttons, move your character with the left stick and swing him around with the right. They are always above ground, which poses some new design challenges but looks hilarious and just feels so much better. Goal-crowding could be an issue for sure, and we're working on a design to remedy that. So, super tilt powerup is no longer part of the powerup pool, and we're considering changing the UI a bit to more intuitively integrate newer features. Please let us know what you think! Ohhh sweet, sweet context. The last tutorial basically was a temporary measure for First Access itch buyers and streamers, front-loading as much information as possible before players even loaded up their first match. This was probably pretty intimidating, and honestly I'm not even sure the videos worked right (there were supposed to be video clips of the game mechanics, but for some people it was just loading up a bitmap font texture instead of a video). The new tutorial is a whole different deal. It features split-screen views for all player configurations, allowing each player to work at their own pace, and the tutorial doesn't move along unless everyone "gets it". You can exit the tutorial at any time, and it is accessible from the stage select screen. After everyone follows the prompts for the basic controls and mechanics, a timed skirmish loads up that allows you to fight your friends and test out the game with unlimited lives before your first real match. We added some pretty noticeable changes to the Hill Stage. We found that the previous stage features (a river/moat around the perimeter that continuously moved the ball counter-clockwise around the stage) really wasn't creating any unique or exciting moments for players and caused gameplay to feel repetitive and predictable. On top of that, the screen spinning constantly could be a bit mesmerizing or even nauseating for some. Our solution was to swap the rivers out entirely for a brand new stage feature: mushroom patches! Mushrooms now populate and wither away randomly, popping the ball backward and exploding when hit! These diversify gameplay significantly more, and are just more fun in general (in our opinion!). There are now shields that temporarily appear for 2 seconds after the ball spawns or re-spawns, preventing sneaky insta-kills on unsuspecting players and instead giving players a sec after each goal to recuperate. We may also work these into a powerup at some point. Aerial deflect quicktime events have also been boiled down a bit and made simpler. Rather than difficulty being based on remaining tilt energy, they are now consistently randomized and put on a global 5 second cooldown. Since the removal of tilt, the tilt meter is currently a save meter instead, showing your save recharging after use. The time window you have to hit X has been drastically shortened, with the warning period beforehand having it's duration randomized to make even the most skilled players occasionally slip up.